FORT WORTH, Texas — With six drivers vying for the two remaining berths to fight for the championship at Homestead-Miami Speedway, the track at Phoenix has added an extra kink to the drama for this Sunday. With a grandstand and infield renovation at ISM (formerly Phoenix) Raceway, the start-finish line has been moved to the area in Turn 2 just prior to what is commonly referred to as a dogleg on the backstretch. The result will be a restart zone in the turn and drivers likely wanting to fan out to the wide apron following the start-finish line on restarts. “I would imagine that we will cross the start-finish line and be nine-wide going through the dogleg and then try to figure out how to get back to two-wide by the time we get to the new Turn 1,” Aric Almirola said. NASCAR sent Jimmie Johnson to the rear of the field to start Sunday’s race for failing technical inspection three times, but Johnson’s car had failed only twice. It also could make things dicey when it comes to the finish. “The only thing that has changed is just where the rag drops,” Clint Bowyer said. “I think where you will see that really play out is on restarts and finishes. Drivers likely will need to take chances if they want to advance to the next round. Joey Logano and Kevin Harvick are already among the final four thanks to their wins at Martinsville and Texas. If any of the six remaining drivers wins at Phoenix, that driver will earn a berth and one spot will be available on points. If none of them wins, two spots will be available on points. 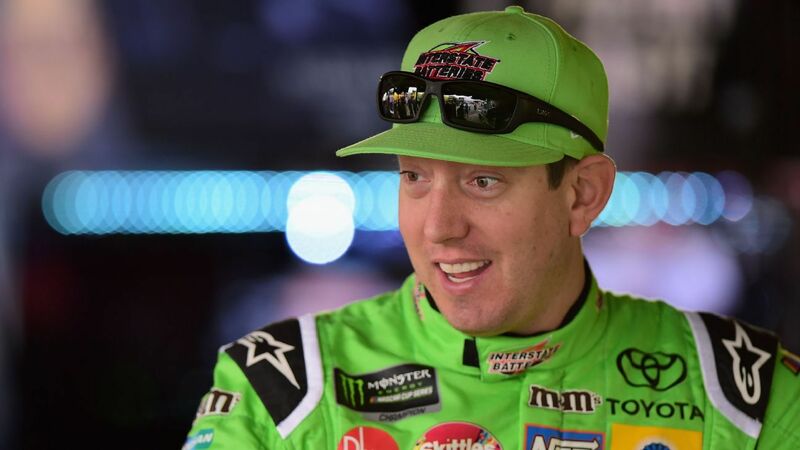 Kyle Busch is 28 points ahead of his brother Kurt, the first driver on the outside looking in going into the elimination race at Phoenix. Martin Truex Jr. is 25 points ahead of Kurt Busch, while Chase Elliott is 39 points behind, Almirola is 57 points back and Bowyer is 73. Clinches if finishes: Busch must win to guarantee himself a spot no matter what anyone else does. If the winner is not Kurt Busch, Elliott, Almirola or Bowyer, he can clinch by finishing ninth or higher even if he doesn’t earn stage points. If one of them does win, he has to finish with four points more than Truex, unless he finishes second, and then it would just have to be three more points than Truex. Outlook: He has finished in the top four in five of his past six Phoenix starts. He’s in good shape as long as there is not an upset. Busch was second in March at Phoenix. Points: 25 points ahead of 5th, 3 points behind 3rd. Clinches if finishes: Truex must win to guarantee himself a spot no matter what anyone else does. If the winner is not Kurt Busch, Elliott, Almirola or Bowyer, he can clinch by finishing sixth or higher even if he doesn’t earn stage points. If one of them does win, he has to gain three points on Busch (four if Busch finishes second). Outlook: Truex was fifth in March at Phoenix, a place where he has inconsistent and mixed results. If nothing goes wrong, he’s fine. But a lot of wrong has crept into this team the past eight weeks. Points: 25 points behind 4th, 28 points behind 3rd. Clinches if finishes: Busch must win to guarantee himself a spot. If Almirola, Elliott or Bowyer win, he must gain 26 points on Truex and 29 points on Kyle, both of whom currently hold tiebreakers over Kurt. If Truex wins, Kurt must catch Kyle. If anyone else wins, he must catch either Truex or Kyle. Outlook: Busch is going to need help if he doesn’t win, and he hasn’t finished better than fifth in his past 18 starts at Phoenix. He was 10th in March at Phoenix. He’s got a hill to climb. Clinches if finishes: Elliott must win to guarantee himself a spot. If Kurt Busch wins, he must gain 40 points on Truex and 43 points on Kyle Busch. If Truex, Almirola or Bowyer wins, he must gain 15 points on Kurt, 40 points on Truex and 43 points on Kyle Busch. If someone else wins, he must gain enough points on two of three among Kurt, Truex and Kyle. If he finishes second or third, he could own all tiebreakers and need one fewer point in those scenarios. Clinches if finishes: Almirola must win to earn a berth to the next round. Because of the maximum points a driver can earn when finishing second, he has no other path to the championship. Outlook: Almirola was seventh in March at Phoenix, which was his career-best finish at the track. He has three career top-10s there. In other words, he’d need a career day to advance. Clinches if finishes: Bowyer must win to earn a berth to the next round. Outlook: Bowyer was sixth in March at Phoenix, but he has an average finish of 18.4 at the track, and that was his first top-10 there since 2013. Yes, he has a chance. But it isn’t good.